I remember first holding you, so tiny in my arms. Next thing I knew, you turned two, angelic, and quite a charm. Remembering your joy with my simple lullabies. Spending time together, nothing else mattered. I loved you so much, never wanting you out of my sight. I wish you could tell me what’s on your mind today? What are the things you’re longing to say? Would you have married a wonderful husband? Live in a castle and have many children? I would run to you, hold you tight and twirl you around! But I guess I knew that from the start. I would not be here now thinking: Why did you have to die? As we approach the anniversary of my baby sister’s life and death, what I have shared is very dear and personal to my heart. As my eyes mist with tears, I still feel my heart burn heavy from missing her! But please understand that I do NOT “blame” God for my sister’s death! Our God is Sovereign and I believe that He allows certain things to happen to us for His greater plan and purpose. (Isa. 57: 1). After all, His ways are higher than our ways. Now, I’m not by any means a theologian, a preacher, or a Bible teacher. I’m just a layman, a simple woman of faith, with a finite mind trying to serve an Infinite God. I know that it rains on the just and unjust (Matt. 5:45); bad things do happen to good people. If I am to be honest, I don’t always understand the mind of God. Howbeit, I purpose in my heart to trust Him! And if I am to be truthful, yes, my heart does have a few unanswered questions. On occasions, in my journey of life I have meltdowns, wallow in self-pity, and find myself clouded by doubts and fears. However, because of His steadfast love and His unfathomable mercy for me, I thank God that I don’t remain in that state of mind! You see, I am a work in progress. In memory of my sister who prematurely passed away 50 years ago by a hit-and-run driver. (To learn more of her story, click here.) She would have been ten years older than my first-born! I had to say goodbye to her when I was nine, just a month after she turned two years old. I remember so much pain and suffering as a child back then. In retrospect, I believe God may have spared her from something worse. I look forward to the Blessed Hope that one day we will embrace one another once again. She will not return to me, but I will go to her one day. And we will NEVER have to be apart. I held her close and cradled her head. Soon left with the responsibility in caring for her, I became my sister’s substitute momma. I loved her and took care of her as best as a seven-year-old could. The day we ran out of baby formula and diapers, I didn’t know what to do. I waited until Anna stopped fussing and fell asleep in her carriage (we didn’t have a crib for her). Then I ran to the corner to a hole-in-the-wall where I knew my mama and step-dad Jimmy were. A blinking neon beer sign over the door clattered when I pushed it open. Dimmed lights hung from the ceiling. The hazy, smoke-filled room from cigarettes made my eyes water and nose run. Loud music played on the jukebox. Boisterous men and women engaged in a game of shuffleboard, others threw darts. Still others sloshing their drinks perched themselves on bar stools, carrying on like screaming peacocks. “Whataya have?” yelled the bartender. I jumped at his voice, thinking he meant me. “Hey Charlie, whose girl is this?” a man grinning with a silver tooth asked. “She’s Ruthie’s little girl,” Charlie answered, pointing in the direction where Mama sat. The all too familiar rowdy voices of my parents’ cursing at each other reached my ears. I ran toward them. When I told Mama about Anna, she and Jimmy started arguing over money. I waited, feeling forgotten, wishing Mama would hurry and come home with me. Then someone handed me a nickel to play the jukebox. I remembered my manners, thanked him, put my coin in the slot, and punched in the numbers to Spanish Eyes. At last, Jimmy gave Mama what she wanted, but he remained roosted on his stool. When we returned home, we never imagined that someone had called the law. They met us at our front door holding my naked sister, wrapped in a soiled blanket. “Is this your baby?” an officer demanded of Mama. “Yes . . . yes . . .” her voice cracked. “Ma—?” I choked back the burn in my throat. He didn’t hear me and shoved Mama in his police car. She looked at me; her face glistened with tears running down as they drove away. “Where . . . is he taking my mama?” I choked, sobbing. I hovered close to Anna, ready to grab my sister, to run fast and hide before he took us to jail, too. In my confusion, I don’t recall what he said except that they were there to help and to take us to protective custody. I protect my sister, I thought. I begged him not to separate us. The cop drove us to a children’s hospital for routine examination and to remain there for safekeeping until a suitable family member claimed us. “That drunken louse came by to bother me again,” she huffed. A neighbor came running and whispered breathlessly with Mama. Right then, a police car pulled up, its radio static coming from within. An officer climbed out of his cruiser and walked toward them. Within seconds, someone let out a cry, her voice sounded familiar. In shock, I witnessed my hysterical Mama sprinting down the street. I stifled a scream. My heart pounded in my chest. I didn’t know what happened, where she was going or why. I don’t remember who drove us to the hospital. But once we arrived, a nurse pointed down the hall to where they cared for her. Except I couldn’t go to see her because I was too young. I had to see her. My legs trembled as I crept to her room and peered through the glass-paned door on my tiptoes. First, I saw a blinking monitor. Then I saw her—my baby sister—with soiled feet still in her favorite, green denim dress, tattered and torn. On her back Anna lay motionless, her curly brown hair matted with blood. Her face bruised and swollen, her baby blues closed tight. I felt light-headed as I slumped on the floor, pulling my knees to my chest, crying. That night, we returned to the scene of the accident. I will never forget the puddles of congealed blood that saturated the street. I wanted to scream. To run. To hide. Blood-soaked rags from my sister littered the pavement. Others offered shallow words of comfort. “Don’t cry,” they said. “Think positive thoughts,” they chimed. “The doctors are doing everything they can for your little sister.” But all I heard was my sister’s blood calling out to me, along with my broken promises: “I’ll protect you,” pounding in my head. A couple of days after, I awakened to the sound of rain and a car door slamming. I peeped out my window and saw a taxi pulling away from the curb. My grandparents, their faces grim and eyes downcast, walked to our doorstep. A shiver ran down my spine and a horrible dread washed over me. I threw myself on the bed, a knot lodged in my throat. Then I heard my mother’s wails. I curled up in a ball and covered my ears. God, it hurts! I cried. Make the pain go away. My sister was gone. Forever. A month earlier, we celebrated her birthday. She had just turned two. I was nine, but felt ancient. Empty. And heavy. The weight of the world on my thin shoulders. Like a fuzzy video tape, fragments of blurred images and sounds played across my mind: Anna’s dancing blue eyes, laughter like the morning sun, vibrant flowers . . . Mama’s primal screams, hushed voices, muffled sobs. At the funeral, I held my breath and willed my feet toward the small white casket. Grandma squeezed my hand. I took my finger and stroked my sister’s face that reminded me of a doll made of plastic, stiff and cold to the touch. Heavy make-up could not conceal her bruises. Her grotesque head cradled by a bonnet, much too small. She wore a new green dress, cleaned and pressed, with no stains. Or blood. I glanced up at Grandma. “Your sister’s in a better place now,” she choked. Then I placed a small cross under Anna’s tiny, rigid hands. My tears blinded me. Why, God? Why? Why did you have to take her? Anna, I’ll love you for always. Mama sat by the farthest wall away from people, away from the coffin. Her eyes were swollen and red. She didn’t seem so tough then. I went to sit by her. The year 1968 was a year of deaths that shocked and changed history. But the girl in her little green dress was the one who mattered to me. She was my sister. My best friend. She lay in an unmarked grave. The area was a lowly, plain grass-field devoid of even a tombstone for my sister. No headrest. No name written. Or flowers anywhere. Just hard soil. Plenty of weeds. I crumbled to my knees and sobbed. Anna, I’m sorry. Sorry I couldn’t do better. Sorry I failed you. I promised, “for always,” yet fell so short. If I could hold you now, I would. If only I’d done more, fought more, loved more. I see myself holding you. Holding you so tight, that time stands still. Darkness cannot swallow us. Pain cannot touch us. Death cannot rip you from my arms. Sorrow cannot engulf us. God, it still hurts . . . bring healing. Before I left the cemetery, my brother and I purchased a tombstone and had it engraved. “Por fin,” I imagined my grandma saying. 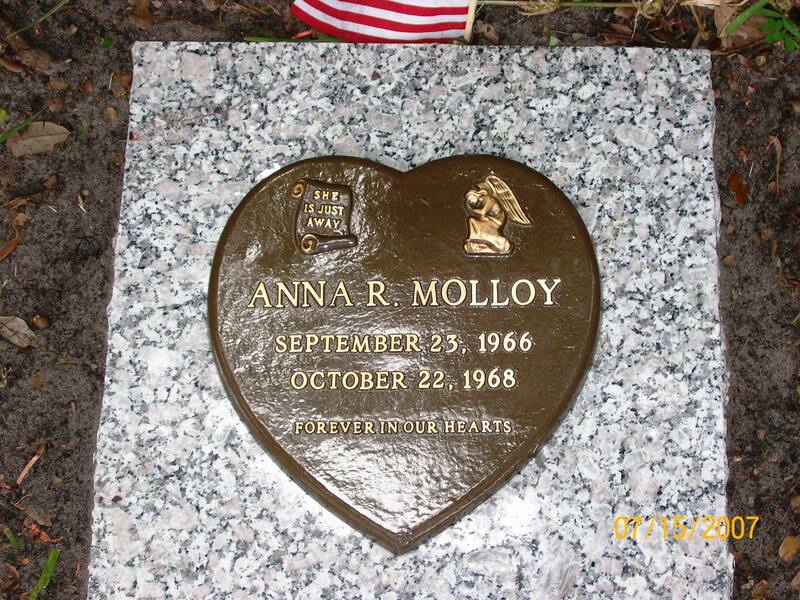 In memory of my sister, Anna R. Molloy, who was struck down by a hit-and-run driver.